Ayr’s first ever Christmas Wonderland was officially opened by South Ayrshire Provost Winifred Sloan last week, marking the start of a new and exciting festive attraction for the area. Christmas Wonderland – a partnership project between Ayr Renaissance, South Ayrshire Council and the Dawn Group – features an open-air ice rink in Wellington Square, complemented by a Christmas market, Santa’s Grotto, tearoom, mini-fair and entertainment (at selected times). 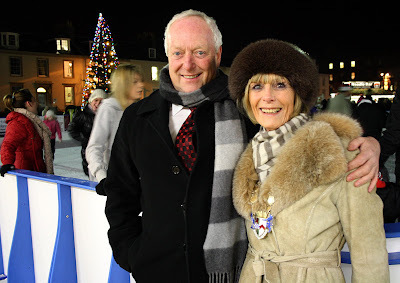 To open the Christmas Wonderland, Provost Sloan was joined by a special skating Santa Claus (AKA former Ayr Bruins ice hockey player Jim Thomson) as well as Councillor Bill McIntosh, Leader of South Ayrshire Council, a number of South Ayrshire Councillors, Community Councillors and representatives from the many businesses that have come together to make the Wonderland a reality. Santa was the first on the ice after Provost Sloan cut a ribbon to open the skating rink and was quickly followed by a terrific display from the Ayr Force Synchronised Skating Team – resplendent in their Santa outfits. There were also performances from singer Nicola Cassells and players from the Braehead Ice Hockey Clan. Making a special appearance were Barassie Primary School pupils Kieran Roberton and Leah Patterson who created the winning Christmas lamppost banner design in the annual competition sponsored by Owen Kerr Signs. Alan Macdonald, Chairman of the Dawn Group, added: “I think this will be a huge asset to the town of Ayr during December and hopefully this will become an annual event. Ayr Christmas Wonderland, which is supported by Paligap, Owen Kerr Signs and the Ayrshire Post, opens every day (except Christmas Day) between 11am and 9pm until 30 December. 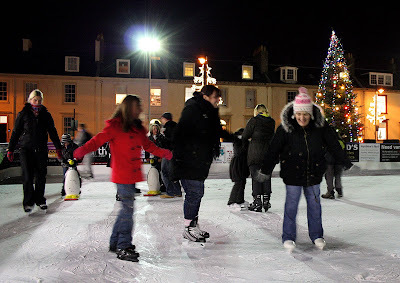 Advance bookings for skating sessions can be made via the Citadel Box Office on 01292 269793 and tickets will also be available on the day, subject to availability. There are currently 809 Ayrshire business stories permanently archived on this site. To locate those of most interest to you, please use the site search facility in the top right hand corner of this page.